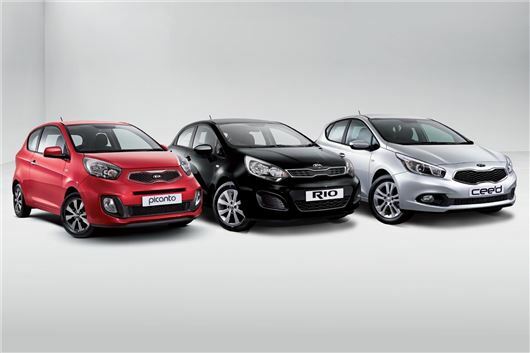 KIA dealers across the UK can now offer the KIA VR7 range of high spec Picantos, Rios and cee'ds at discounts of up to £1,000 and 4.9%APR finance deals. Also on offer, the KIA Care-3 all-inclusive servicing package providing private buyers with the first three services for just £99 on the ‘VR7' range. Care-3 is also fully transferable to subsequent owners. All ‘VR7' models share the same upgrades. These include air conditioning, leather trimmed steering wheel and gear knob, Bluetooth Connectivity and USB & AUX ports. Exterior features such as alloy wheels, reversing sensors, electrically adjustable heated door mirrors and electric front and rear windows (on 5-door models) are also included. Finance is available at 4.9 per cent. While a £1,000 KIA Access Deposit Contribution is also available on the pro_cee'd, cee'd 5-door and cee'd Sportswagon versions. The Picanto 3-door ‘VR7' 1.0 69PS and Picanto 5-door ‘VR7' 1.0 85PS both come with all the ranges standard features. Both Picanto models also come with a host of other safety features such as ABS with Electronic Brakeforce Distribution (ESB), Brake-Assist System (BAS), Electronic Stability Control (ESC), Vehicle Stability Management (VSM), six airbags and Hill-start Assist control (HAC). The Picanto range also include a selection of exterior extras such as silver finished interior door handles, chrome exterior door handles, premium black upholstery and a black radiator grille. With an offer price for the 3-door Picanto of £8,795 and 5-door Picanto at £8,995 both models in the ‘VR7' range give customer savings of £750. The ‘VR7' Rio range includes models of Rio 3-door and 5-door 1.25 85PS and Rio 5-door 1.1 CRDi 75PS, all with savings of £1,000. All the Rio models include the standard added features along with exterior extras such as body-colour bumpers, exterior door handles and door mirrors. The Rio ‘VR7' range also has the safety features of ESC, VSM, HAC and Anti-theft Alarm System. The ‘VR7' range is available on the pro_cee'd 1.4 99PS, cee'd 5-door 1.4 99PS and 1.4 CRDi 90PS and the cee'd Sportswagon 1.4 99PS. The pro_cee'd ‘VR7' 1.4 99PS starting at £13,495 comes with all of the standard ‘VR7' packages as well as 16 inch alloy wheels, black ‘abtract' cloth, steering wheel mounted controls and a rear spoiler all with a customer saving of £1,000. The cee'd 5-door and cee'd Sportswagon models also come with a high trim level. This includes a rear spoiler, projection headlights, front fog lights and daytime running lights. The safety additions on top of the range's standard features include emergency stop signalling, ESC, VSM, ABS (Anti Brake System) and finally HAC. The cee'd Sportswagon ‘VR7' 1.4 99PS also comes with a luggage under-floor box and side tray, luggage 12V power outlet and roof rails. The ‘VR7' range is available in four colours, white, black, silver and red. All models benefit from our pioneering 7 year/100,000 mile manufacturer warranty. For full details visit www.kia.co.uk.